The Colorado Arts and Crafts Society (CACS) is a non-profit (501.C.3) volunteer organization dedicated to the study of the Arts and Crafts Movement in Colorado (c.1895-1920) through meetings and events such as lectures, tours and other educational programs that enhance awareness of this rich cultural heritage and stimulate interest in its preservation. We are celebrating our 20th anniversary in 2017. The Colorado Arts and Crafts Society (CACS) was established in 1997 at the Boettcher Mansion, a National Register landmark built in 1917 (celebrates it's 100th year anniversary in 2017) as a seasonal retreat for Charles Boettcher. 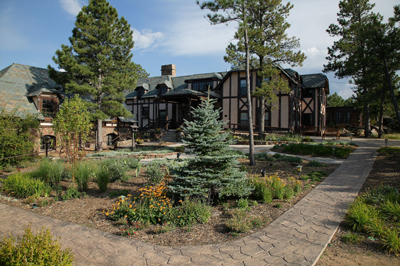 Nestled within a 112-acre nature preserve on top of Lookout Mountain in Golden, the former "Lorraine Lodge" was constructed of stone and timber taken from the site and is considered a great example of the Craftsman style. It is now owned and operated by Jefferson County as a special events site and conference center. In 2005-07, the Mansion completed a multi-faceted Capital Improvement Plan, funded with $3.1 million from the State's Conservation Trust Fund. The project included construction of a compatible kitchen/storage addition and garden shed, many mechanical improvements (air-conditioning and snowmelt systems), and a period garden with native xeriscape plants, recycled flagstone and ambient lighting. A new slate roof with copper trim and gutters replaced the former wooden shakes and shingles. The interior is now resplendent with Stickley, Roycroft and other Mission-style furnishings, historic paint colors and Arts & Crafts-inspired wallpaper and stencil patterns. © 2009 Colorado Arts & Crafts Society. All Rights Reserved. Last Updated Friday, January 13, 2017.